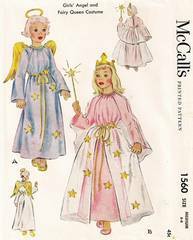 An original vintage sewing costume pattern for dress, overskirt, halo, crown, cape and wings. Copyright 1950. Girls' Size Medium 6-8; Breast 24-26; Waist 22-23. Pattern is complete. Several of the pieces have been meticulously cut and folded. The remaining pieces are uncut. The envelope is in very good, well preserved condition.